It's widely assumed in Indiana that their marital history, and more specifically her desire to keep it private, is his main point of hesitation over running. It shouldn't be an issue, by all rights it's wholly irrelevant and nobody's business, but unfortunately that's not how presidential campaigns work. she is now back home, happily married, where Jesus wants her to be. One man, one woman, and not killing unborn babies. no need to be perfect, just Jesus-forgiven. After the 2008 Messiahpalooza I guess I can't blame my liberal friends for being indifferent to the Republican search for a mortal political with executive experience. now I like Herman Caine for the Republican choice. 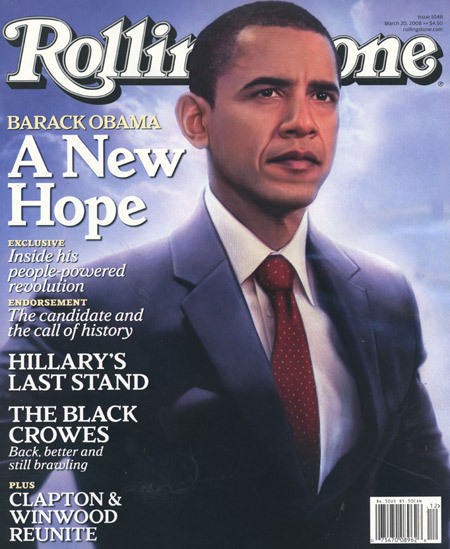 Yes, all liberals worship Rolling Stone! Great stuff as always, INDY. "It's a shame that young people don't get more involved in politics." Young people go nuts for a candidate in 2008 and actually take an interest. Mocked by the Right for getting involved in politics. what did the Republicans do between 2001-2009 that makes you think they deserve to be anywhere near the White House? so you have proof that the republicans foiled a large-scale terrorist attempt, then? just because nothing happened didn't mean it wouldn't have been the same with a democratic president. If a democratic president had put into effect all the measures that GWB did, then yes....it would have been the same. He who lives in a glass house shouldn't throw stones tea bags. The first attack on the WTC occurred a few weeks into Bill Clinton's presidency, which came after 12 years of a Republican in the White House. There were no other non-domestic terrorist incidents in the U.S. until 2001, which happened a few months into Bush's presidency. And there have been, of course, no other attacks since then. I don't buy into the argument, nor will I ever, that one party over the other is more committed to keeping people safe and protected. That's tin foil talk. But you can continue believing everything that Fox News tells you to think. that is a ridiculous comparison. bush was in power during 9/11 and didn't put these measures into place until after the fact. it's unfair to expect obama to do something that's already been done. and as for clinton, if he'd put all these things in place during his presidency, people would've called him nuts and blasted him for wasting so much money. and assuming these measures would've prevented 9/11, this whole conversation would be a moot point.